Concerto in C Major for 2 Trumpets, Strings and Continuo. RV537. Antonio Lucio Vivaldi was born in Venice in 1678. An earthquake struck the city on the day of his birth, and it is rumoured that his mother, fearing that his life was in danger, insisted that he was baptized immediately by the midwife and dedicated to the priesthood. Fortunately her fears were unfounded. Antonio was baptised again some two months later in the church of San Giovanni Battista, and grew up to be not only a priest but also a virtuoso violinist and one of the greatest composers of his age. He wrote many instrumental, choral and orchestral works, including concertos, operas and sacred pieces. Particularly notable were the compositions he wrote for the orphaned girls of the Ospedale della Pietà, where he worked as music director between 1703 and 1740. Vivaldi was a very practical composer. His set of twelve violin concertos know as L'Estro Armonico, which are famous for their harmonic invention and virtuosic brilliance, are well within the compass of the talented amateur. Consequently when the set was engraved and published as his Op 3, it gained immense popularity throughout Europe, enhancing his fame and reputation. 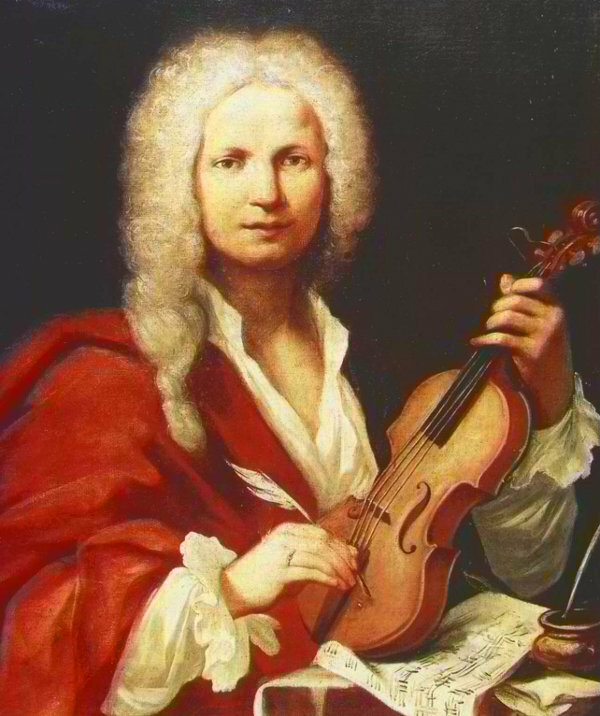 Sadly however, Vivaldi's popularity declined as he grew older. Audiences began to consider his music outmoded, and performances of his works declined. In his last year he moved to Vienna in the hope of preferment by the Emperor Charles VI whom he had met Venice. He was forced to sell many of his manuscripts to fund the trip, and the move was a disasterous one. The Emperor died soon after Vivaldi's arrival and he was left without a steady source of income in an unfamiliar city. He died a pauper, soon after the Emperor, on the 28th July 1741. His funeral took place in St. Stephen's Cathedral where among the choir boys was one Joseph Haydn. He was buried in a simple grave which no longer exists. The concerto for two trumpets is typical of Vivaldi's writing. The two outer movements are brilliant allegros with lots of exhilarating high virtuosic passages for the soloists. There are sections of dramatic dialogue between the orchestra and the soloists to start and end the movements, and longer episodes for the soloists and continuo, alternating with the strings. The slow movement, scored for strings alone, is very short and forms a strong contrast to the outer movements relying for its effect on inventive use of harmony. Vivaldi's concerto for two trumpets was performed by Martin Hurrell & Alex Caldon accompanied by the Portobello orchestra on the 2nd July 2011, conducted by Anthony Weeden.